One of my favorite things to do in summer is to gather with friends. Nothing fancy. An unplanned picnic in the yard. Just hanging out in the middle of the day soaking up sunshine. It's fun to casually drop in on friends but certainly not empty handed. 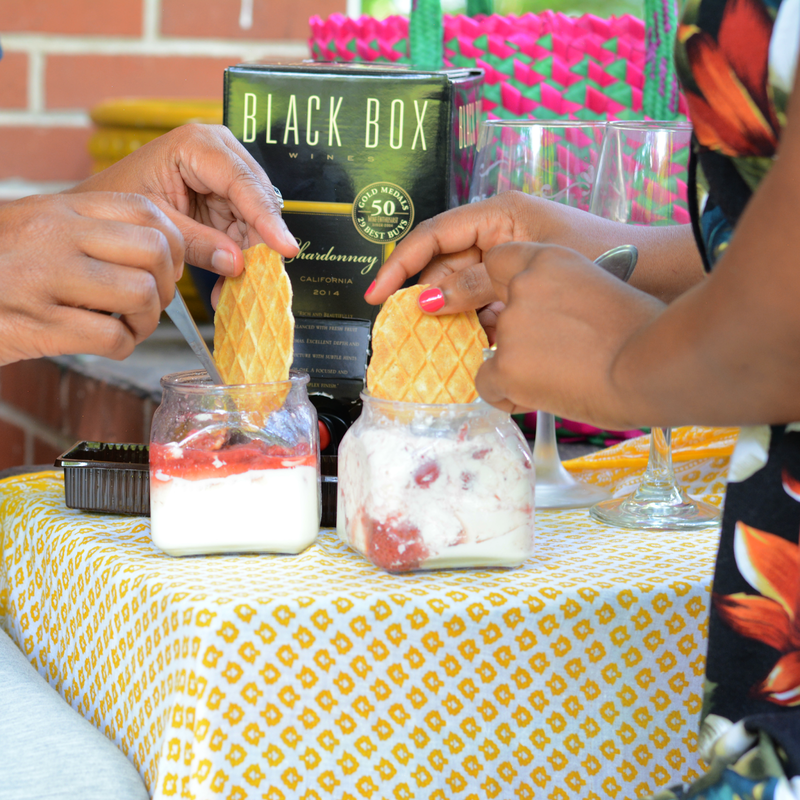 Deliciously cool strawberry panna cotta and chilled Black Box Wine is all it takes to get the impromptu party started. 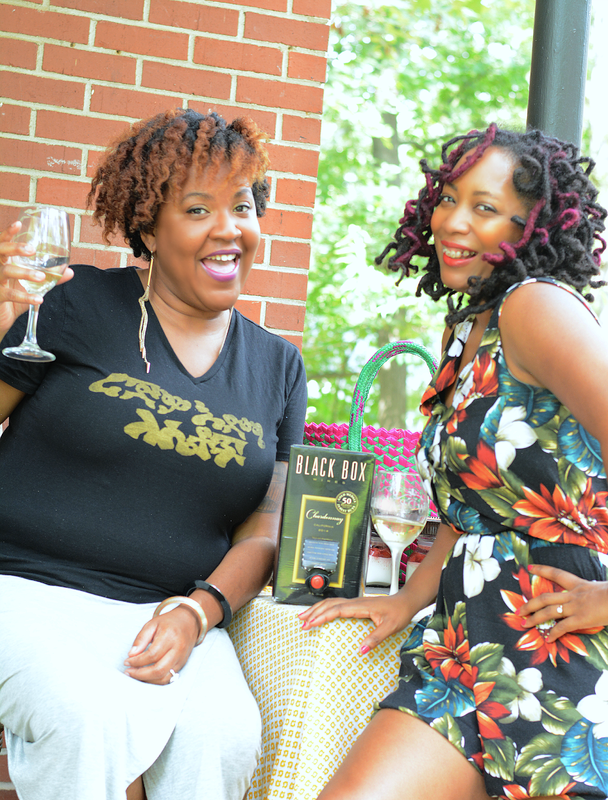 I love to show up with Black Box Wines in hand. It gives me a chance to express my love of box wine. Trust me, it's good stuff. I have a glass of wine a night. I started buying box wine when I noticed the taste change in my corked bottles over time. Box wine taste the same from first glass to last. I know box wines get a bad rap but times have changed. Black Box Wine in particular has won over 50 gold medals for quality. It's also the right choice for the wallet being 40% less than comparable bottle wines. Not to mention it stays fresh for 6 weeks so there's not rush to finish the whole bottle when at a small gathering. 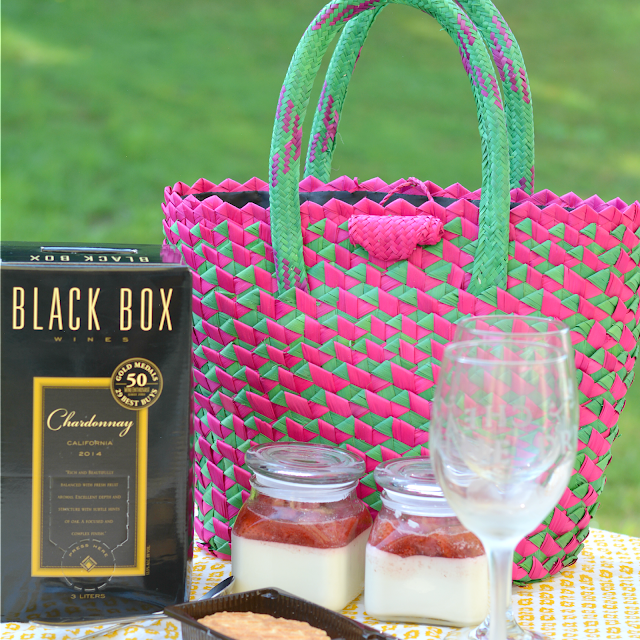 Chardonnay Black Box is delicious with strawberry panna cotta. Panna cotta is creamy and slightly sweet. It doesn't interfere with the tropical mango and green grape flavors of the wine. In fact, the fruity flavors pair well with the strawberry sauce in this creamy dessert. Panna cotta is also so simple to make. No baking required. Pour milk in saucepan and sprinkle gelatin on top. Allow to sit for a couple of minutes. Turn on a low heat and add sugar. You'll be warming the contents not boiling it. Stir mixture until sugar has completely dissolved. Whisk in the the cream. Stir in the extract. 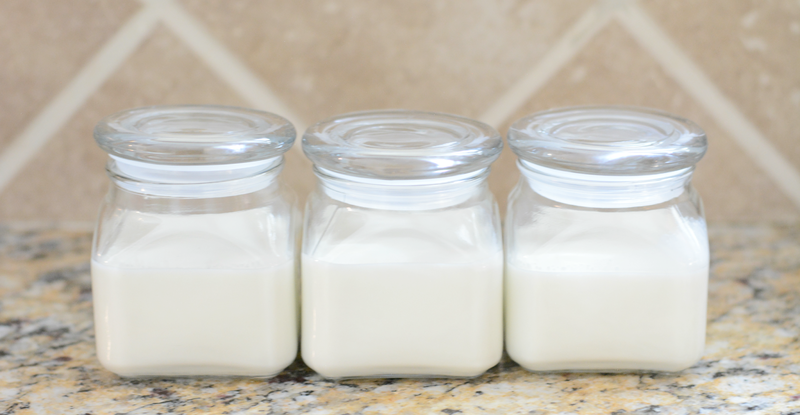 Pour into jars and chill at least 4 hours. 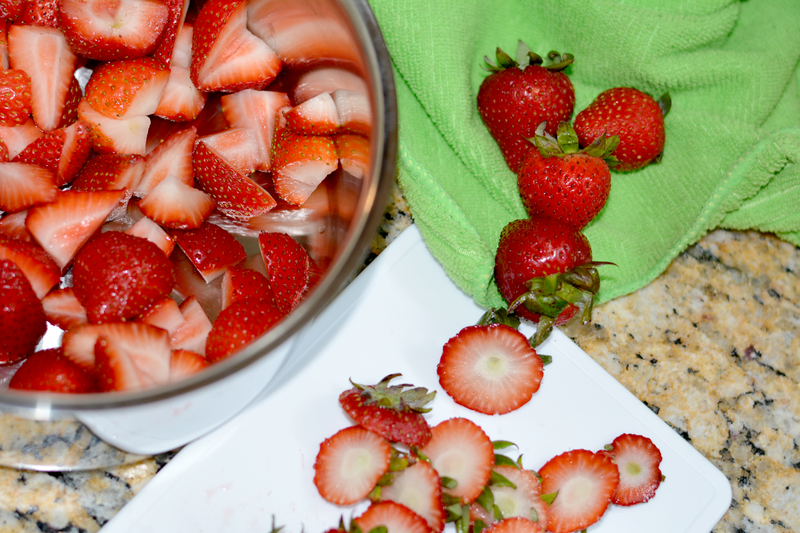 Cut the strawberries into quarters. Heat in a saucepan over medium-low heat until it's soft and mostly liquid. Add the the agave and a squeeze of lemon juice. Remove from heat and allow to cool. Once the panna cotta sets, add strawberry sauce on top. Wrap the pots and be on your way. Don't forget the wine! For more great recipes, visit the Simple Entertaining Social Hub. Want to enjoy your Panna Cotta in California? Enter the Black Box sweepstakes for a chance to win a trip the wine region of your choice! What's your favorite "drop in" dish to make? 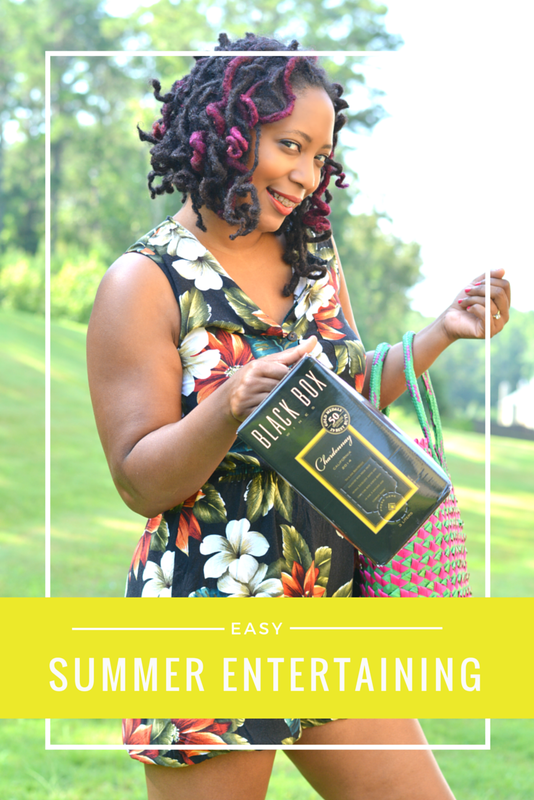 I've been wary of box wine for a while (Franconia gives me horrid headaches), but now you have my curious about the Black Box Wine. :) Might have to grab it for some girls' time myself. 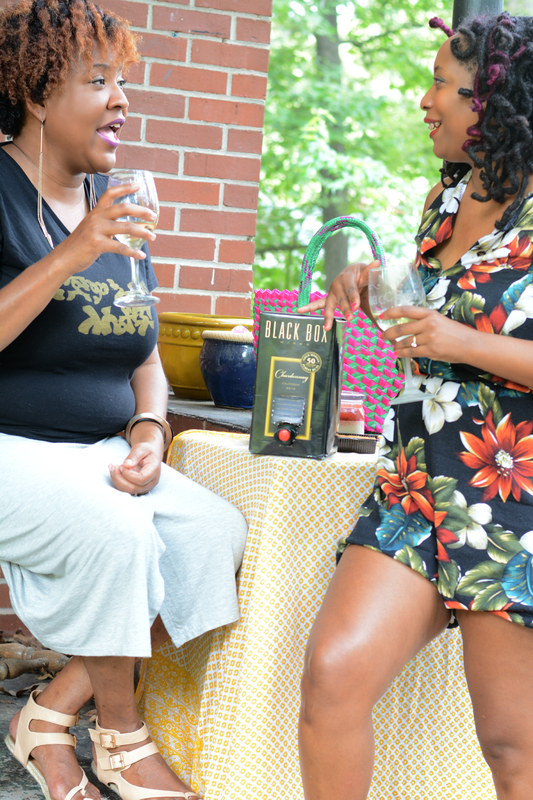 I am not a wine girl, but I love bringing it to gatherings for other guests to enjoy. The black box is so sleek and cool looking - they'll think I know what I'm doing, lol. 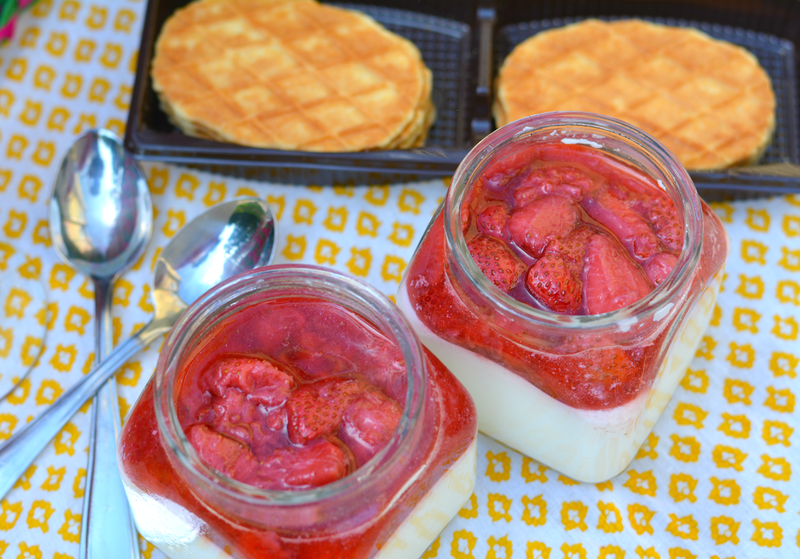 I love the panna cotta idea for a quick outdoor brunch idea too. What a fun idea for quick summer entertaining! I love when people drop by and bringing food to friends, so I can imagine this, paired with the vino, would be a lovely thing for the people I love! LOVE this! Thanks for sharing this great idea! These are too cute. What a great idea. I love the presentation in the cute jars!